Preheat oven to 425° F. Slice baguette into 8, 1-inch thick rounds. Mix ingredients for herbed olive oil. Brush herbed olive oil on both sides of each baguette round. Place rounds on a parchment paper-lined baking sheet. Bake for 5-6 minutes, flipping once halfway through. 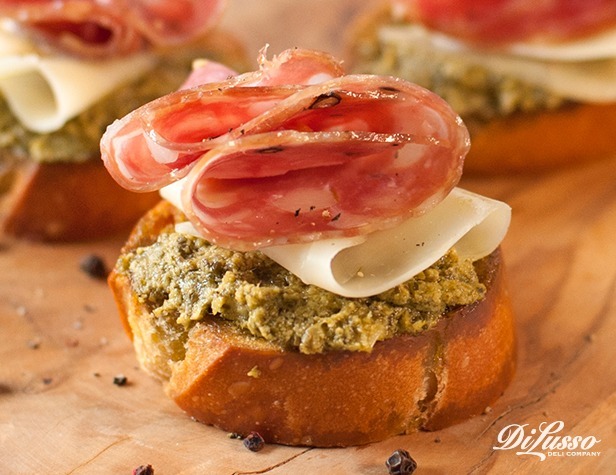 Top baguette rounds with 1 tablespoon pesto, 1 cheese slice and 1 sopressata slice. Sprinkle with fresh basil and cracked pepper.